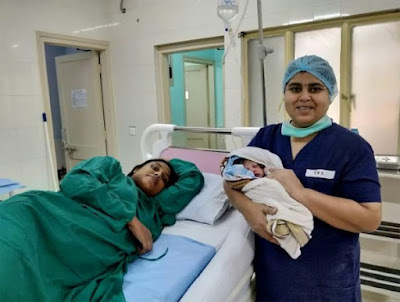 A heavily pregnant woman stranded by floods in the Indian state of Kerala gave birth just after being airlifted to safety, an Indian Navy spokesman said, as the military stepped up rescue operations on Saturday. Dozens of navy helicopters have embarked on high-risk missions to save people from rooftops and isolated land as the southern state battles a flood crisis that has left at least 324 people dead. Sajita Jabeel, 25, was winched up by Commander Vijay Verma, who has been widely praised for leading the rescue in the Aluva district of the state’s main city Kochi. “The lady was in labour, her water had broken,” Verma told News18 television. He called the relief mission “very challenging” and said his team had rushed to find the family after receiving an emergency call. Jabeel gave birth to a healthy baby boy after being rushed to hospital. About 60 military and coast guard helicopters and hundreds of boats are scouring the flood zones across the state for trapped victims. The military said that tens of thousands have been rescued in the past week, but thousands more are feared trapped. Another pilot winched 26 people up from a rooftop in Kochi on Friday while hovering between trees and other houses just two days after receiving a medal for saving a fisherman last year. A video of Captain P. Rajkumar’s Sea King helicopter pulling up the victims has been widely shared on social media. He ended up with 32 people on board. “It was a life-threatening mission but it’s an unprecedented situation. We can’t leave behind our people,” Indian Navy spokesman Captain D.K. Sharma told AFP.